The Serenity Gatherings™ are a series of events held throughout the year for busy women who need some well-deserved rest and relaxation. 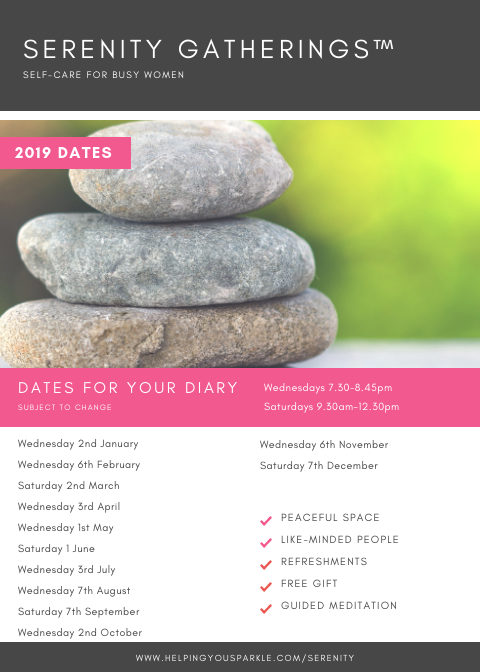 Join us for an evening, or a Saturday morning ‘retreat’, away from the busy world, enjoy conversation with like-minded women, some guided meditation and a cup of tea and a slice of cake. To be kept up to date on forthcoming events, join the Women in Serenity™ mailing list. You’ll also receive regular insights on topics women understand straight to your inbox.